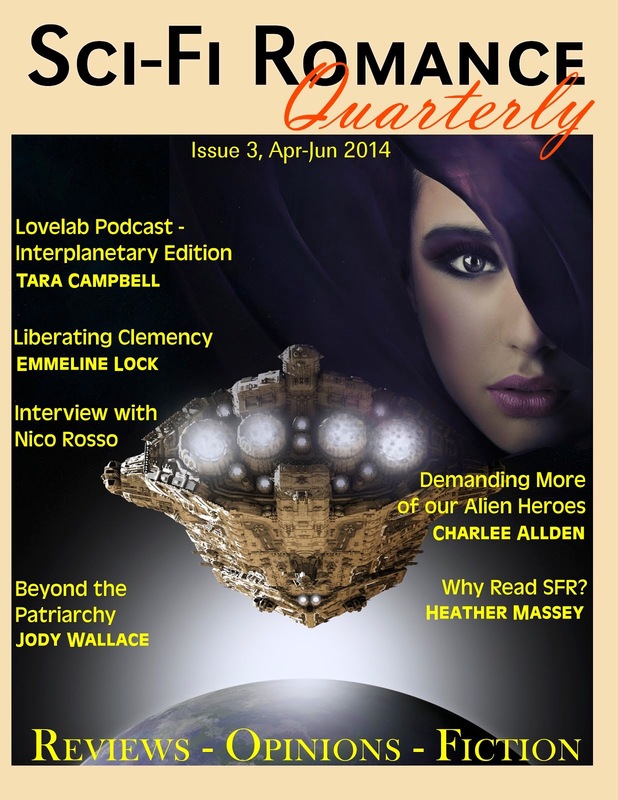 Emmeline Lock: RWA'S RTN aka Romancing The Novel aka Rockin' The Noggin. 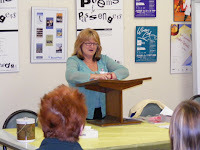 RWA'S RTN aka Romancing The Novel aka Rockin' The Noggin. I might officially be a real writer. "Cods!" you might say. "You've been writing seriously and submitting (and being rejected - sorry about that bit) for over a year now!" True. But last Saturday I felt like a real writer. 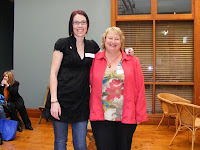 On May 15th in Adelaide, our fair and only slightly grimy city, Romance Writers of Australia held one of their Australian Roadshows, called 'Romancing the Novel'. 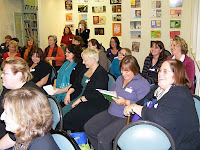 SARA (South Australian Romance Authors) hosted it at the SA Writer's Centre. Yvonne Lindsay and rapt attendees. How pretty is the Writer's Centre? I've met a few of the SARA people before, and thought I should like to go along (aka I was DYING to go). Yvonne Lindsay and Anna Campbell were the main drawcards, and there was also some very excellent local talent - Elizabeth Rolls, Trish Morey, Claire Baxter, Anne Oliver & Christina Carlisle. So, I duly downloaded a few eBooks from these authors (I had previously only read Anne Oliver). I got stuck on Elizabeth Rolls' LORD BRAYBROOK'S PENNILESS BRIDE (I didn't want to rush it - very good), and was only a few pages into Yvonne's DEFIANT MISTRESS, RUTHLESS MILLIONAIRE when the highly-awaited day arrived. The day started with a cracker-bang and just got better and better. Anna and Yvonne started us off with a 'Secrets of a Best-Selling Romance' session. I have been reading Deb Dixon's GMC (Goal, Motivation, Conflict), and they spoke about just that, and had us looking at those elements in our own works in progress, which actually made me question the GMC in my current wip more than reading Dixon's book did. Yvonne and Anna spoke about Flimmers (Flying into the mist, Pantsers) or the opposite, Plotters. Funnily, Yvonne is a master plotter and Anna at the other end of the spectrum. These two spoke together really beautifully and it was interesting to see their differing working/speaking styles. They both had us giggling all day long! Without going into fan-girl detail, there were sessions on characters, and and excellent one on Emotional Punch (incorporating Deep Point of View) with Anna that was excellent. I have always tried to keep right inside my characters' heads, running the risk of bogging the story down. I'm now going to be more mindful of where I am doing what kind of writing - keeping the Deep POV for more emotive scenes, not just delving into it whenever I fancy. Anna also had a great section where she talked about writers' tendencies to concentrate on those senses that were most prevalent in their psyche (eg sight, touch) in their writing. We talked about a major scene in out wips and made lists of the things the character felt, heard, saw, tasted, and smelled. My biggest list was definitely sight, the others were dead even. So, I know now to use the other senses in my writing as much as I talk about what the character's SEE. Wow. Great stuff. In fact, there was so much superb stuff to take away, that my head was spinning, but it was all GREAT information. Luckily, I took copious notes on loglines, high concept, great authors, writing styles, resources, filter words, voice, genres and publishers. Christina Carlisle held a quick but meaty session on ePubs - I really wanted to meet her, as I'm friends with her nephew. She was delightful, and a fountain of knowledge. 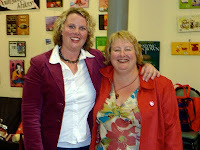 I met some lovely people, aside from the authors, including Bronwyn Stuart who lives close by, and is responsible for some of the fab pics on this post. Thanks, Bronwyn. (My pics are the fuzzy ones, let's just get that straight. :) You can see more on her blog at her webbie. This is Bronwyn with Anna Campbell, who affectionately calls the former "Stalkey"
SO - the intention is - get my tush to SARA meetings and join RWA (GASP! I know! But, if I'm a member, they won't let me judge for R*BY, which might make me cry - I will join soon ((see above re 'real writer')). Speaking of tasty, there was also the goody bags and the novel stash. Ten books, nearly half of them author-signed. With MY NAME in it. SQUEEE! Congrats to SARA and RWA for holding such a fabulicious seminar. See you next time. Glad you enjoyed the day so much. And Lord Braybrook. S'alright, Bronwyn. Thanks for letting me steal your pics! And yes, I'm sure everyone will think she meant 'super tall'. Seriously, I thought you and her were quite adorable. She's a cracker, isn't she? So there for coffee, just name the time and place. I did enjoy Lord Braybrook. It was a good, smooth read with excellent characterisation. I find if I get drawn into a book, I have to take the time and read it properly, others, I will read quite quickly if they're okay, but not gripping. LDPB was one of the former. Elizabeth & Bronwyn - I missed SARA last week (grr) - hope everyone had a good session. Carol said it was great, and that she set some goals, which I love to do. I SHALL be at the next one - I've promised Carol a ride. Omigod! 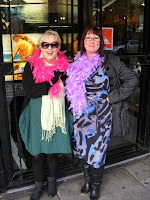 Anna Campbell AND Elizabeth Rolls have visited my blog! *swoon* I may have to lie down! Srsly, many thanks for stopping by and taking the time to comment, Anna. I completely understand the connection between Bronwyn and yourself. I'd love to have my own Stalker one day. So great to read your post and know you had a fabulous day! We really thought it should be, but it always comes down to the people who come along to make it special. Thanks for coming. Look forward to seeing you at SARA meetings! Wow. Thanks for stopping by Trish. I have been remiss, but I didn't mention the fabulous work that yourself and the other lovely people of SARA did on the day--it ran like clockwork, and was truly informative. And my favourite--fun. The best way to learn, methinks. So yay for you too, Trish! And I read HIS MISTRESS FOR A MILLION in preparation, too. It was excellent - I mean who doesn't love a Mediterranean gazillionaire? Your stuff, too, is a great, flowing read. I still have that double-spread from the Sunday Mail from years ago --where SA HQ Authors were featured. I must try and put a hand on it. It was quite an inspiration! Congrats again on the wonderful RTN! I'll see you at SARA. Emily! What a fabulous blog. So neat to hear you got so much out of the seminar day. I know we really enjoyed meeting you all and sharing what we've learned along the way. All the very best with your writing! Man oh man, you ladies are killing me! Look at all the fabulousness visiting my blog. I'm deeply touched. Aren't you all just beautiful for coming to visit. Hugs all 'round! 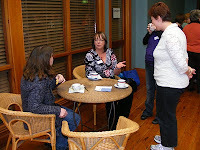 So pleased to meet you at RTN, too, Yvonne. I suspect I'm a disorganised person who works very well if I ever manage to get organised, so both you and Anna touched a chord with me that day. I'm a teacher when I'm not sleeping in my coffin (LOL! ), so plans and formulae are something I love. Thanks very much for your time - I loved your session on characterisation - something I need help with often! I'm still in the beginning stages of DEFIANT MISTRESS, RUTHLESS MILLIONAIRE (my edits for my current wip came through the night before RTN from my gorgeous CP's, and I've been shuffling through those), but I am wanting to get back to it asap! Great Blog. It was a fab day. So nice to meet you. I also learnt I don't use enough smell senses. Hmmm, I wonder if I'm trying to tell myself something? Hope not. Good luck with your wip's. Was lovely to read about your fab weekend at RTN. Great pics, too. Wishing you all the best with your wips. Love the titles. His Deadly Echo sounds very cool! So nice of you to drop by - I'm absolutely chuffed that so many people have come to see me here! I wonder if, as a parent of small children, I haven't stopped using my sense of smell out of necessity. :) Perhaps you're the same? I love how we've admitted we've got a problem - first step to using all five senses equally! Hehe. Best of luck with your work, too! It was a truly great weekend at RTN - I don't think I was alone in saying I got sooo much out of it! I also run them past my CP's - Rach and Anna Hackett (Silhouette Nocturne Bites), and if they like them, they stay! Until I change them, of course. 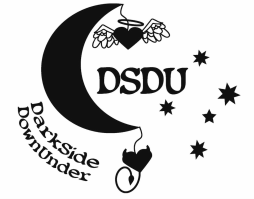 DARK SIREN is the third version for that wip - and if it gets published, I'm sure it will change again. Bronwyn did take some lovely pics, didn't she? Thanks for dropping in Cathryn! I'm behind the times...(the week has gone differently than planned). Fantastic round-up of RTN. So glad you enjoyed it and that you will be attending SARA meetings. Massive kudos to you, too for all of the work you did at RTN. It was a fabulous seminar that ran beautifully. So YAY for you! Thanks Em! Hard-core recuperation - more like body said 'oi'. So hopefully June will be the month of writing :) And yay for coming to the next SARA meeting. See you then! !